It’s only natural to be on a look out for easier and faster way to work in the present digital world. There is always someone who is developing a new tool or app, only because it's now possible for anyone to do that! When it comes to PowerPoint presentations, there are new challenge every day. Seeking out-of-the-box tools to find a solution to the problem has become as important as creating the content for the presentation itself. As and when the features of PowerPoint are updated, there are always tools that crop up to further ease the use of a feature. Can you still remember what your first PowerPoint presentation looked like, or what format it was? If you asked me, I’d have to think hard. I never even imagined that it was possible to design on a PowerPoint. If I had to give a presentation in college, I usually picked the default template and placed my text where ever I wish them to be. It never occurred to me about how my presentation would look to a panel of reviewers or my classmates as long as I had all the right stuff in it. Chillibreeze opened up a whole new world for me. Using add-in tools to PowerPoint has made work for our PowerPoint designers so much easier and faster. We have been using ShapeChef for quite some time now, and it has proved to be one of the best tools we have used till date. ShapeChef is a library tool for icons where you can upload and store all your icons in one place. It can be used with Microsoft PowerPoint 2007, 2010, 2013, 2016 (Including Office 365) for Windows. You can store all icons and shapes that you use for your presentation in ShapeChef and access them easily without any hassle. Download the app and install it to make use of the app. Store all your icons in a folder and upload them in ShapeChef. Now they are readily available for your use on the sidebar. Make sure that you label icons and shapes correctly so that you can look them up through the search tab. Ever since our Presentation Services team started using this tool, it has made us so much more productive. We are faster and better and our customers’ feedback stand testimonial to this. PowerPoint icons are used extensively for delivering a presentation these days. There is no doubt they are an effective visual form of communication. Marketers love using them to cut their story short. SlideProof works well with other add-ins and requires minimum system resources. This tool checks for errors on your slides provides a library where you can store and share templates, shapes and slides with your team. It also has options to share your presentation via email directly. The predominant feature of SlideProof is the ‘Check’. Check fixes errors like language, double spacings, an inconsistency of font sizes in a slide, missing punctuations, Splitting and merging of textboxes and tables, and alignment of shapes and much more. SlideProof tool has proved to be very useful for the team in Chillibreeze. It saves a lot of time in quality check of each presentation deck before we send it back to our customers. It takes just 5 mins to fix the alignment, spacings and consistency in all slides rather than manually checking which takes 30 mins to an hour. There is no escaping from charts even in a presentation. Your audience likes to see numbers accompanied with charts. Default PowerPoint does provide different options of charts but it also proved to be limiting in terms of designs and forms for some of our customers. Think-cell offers you simple and easy to design charts with the right features like Waterfall, Gantt, Marimekko and Ggenda. These functions are available right at the PowerPoint object. Thinkcell improves your PowerPoint work and such enhances slide creation efficiency and quality. Out team of PwerPpint graphic designers have been using Thinkcell for a few years now, and it has brought great result and satisfaction to our customers. In fact, one of the first questions prospective customers ask us is “do you guys know to use ThinkCell?”. When you are familiar with charts, it becomes very easy to use Thinkcell. Install think-cell and you can access it from the insert tab ribbon in your PowerPoint. The user guide attached with the tool is extensive and easy to follow. Make sure you take a look before actually starting with ThinkCell. Thinkcell also offers other essential elements such as table of content, agenda, and shapes. Good news to all avid PowerPoint users! 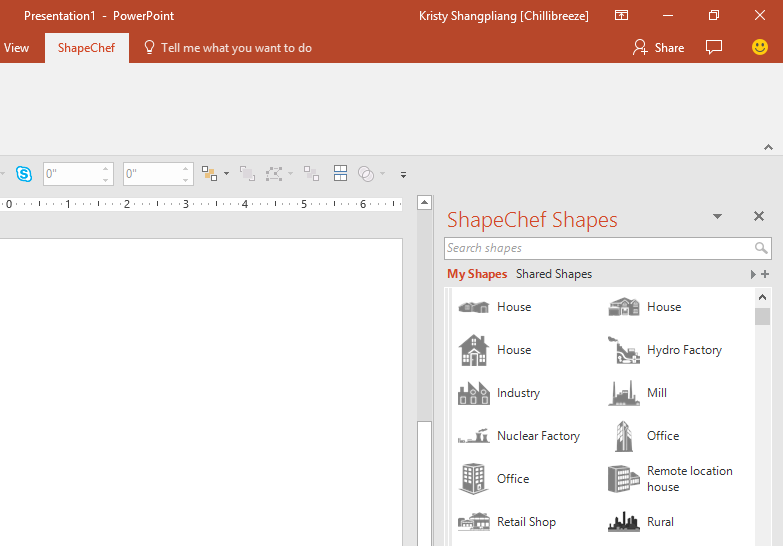 Microsoft has made it possible to add tools into your PowerPoint available in Microsoft 2016 (Including Office 365) for Windows. All you have to do is go to insert tab. Go to ‘My Add-ins’ tab (see image below). Go to ‘Find more add-ins at the Office Store’ which will be at the bottom of the pop-up. 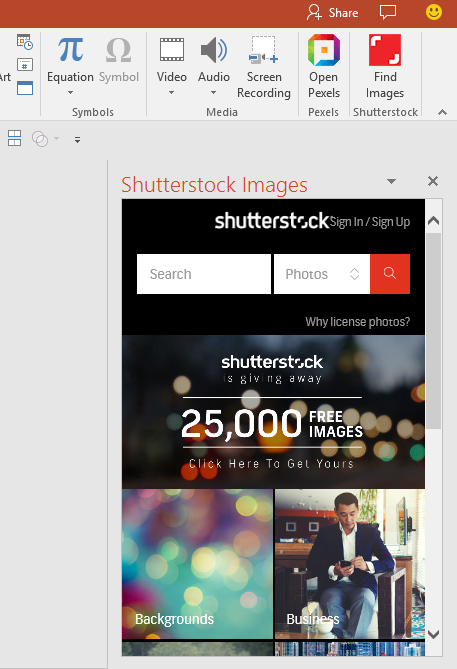 ShutterStock is now accessible directly from your PowerPoint. Look up ShutterStock on the search tab click on ‘add’. It will paper on the right side of your PowerPoint. Just click on the app, and you can search for photographs you want to use for your presentation. You don’t have to go to your browser anymore to get a Shutterstock photo. These are but some of the tools that make our lives easier. They are simple to incorporate and easy to use in our day to day work. Make sure you pick the best tool that suits your need. We, at Chillibreeze, have tried and tested out a few tools but I felt that these are the most helpful ones worth mentioning and sharing. If you already have a subscription with add-ins like ShutterStock or other free stock photos, make sure to make them easily accessible when you are working on your presentation, so you do not have to keep flipping your screen from time to time. Are there any other PowerPoint tools that consultants use that you would like to share with us here?